Snyder Attorneys, P.A., seeks to offer its clients the expertise and experience that companies expect to purchase from much larger law firms. Snyder Attorneys, P.A. seeks to provide executives, other individuals, and smaller companies with quality legal services but without the fees charged by larger firms. 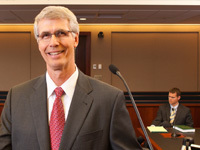 Steve Snyder, one of three principals at Snyder Attorneys, P.A. has devoted a significant portion of his career over the last 20 years to serve as lead counsel on some of the more prominent and successful employment discrimination cases nationwide. In those cases, he has been matched up against some of the largest law firms in the country. Snyder Attorneys, P.A. helps executives with contract disputes and other employment issues. It helps executives negotiate new contracts of employment or to negotiate favorable separation arrangements. Snyder Attorneys, P.A. also represents executives and other individuals with claims arising from wrongful terminations, including discrimination claims, both as individual claims and in class-action lawsuits. Please contact us for an initial consultation regarding your employment law issues.